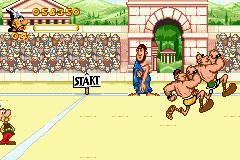 GBA Astérix & Obélix: Bash Them All! (Europe) in 21:08.9 by TimmyAkmed. Rome has conquered Gaul and put a wall around the last village of resistance. Asterix and Obelix decide to tour the Roman Empire and collect souvenirs in order to show Caesar the futility of walls. It's hard to get the story from this TAS, however, because they fly through the levels so quickly, absorbing damage and rarely bothering to fight back. Though, they do take some breaks to participate in local sports. After all, if you're trying to send a message to Caesar, why not beat his athletes in one Olympic event—or all of them?